FAIRMONT — Staff at the West Virginian High Technology Foundation in Fairmont are working on projects that can help improve the safety of military personnel, create high power electronics and execute enhanced detection. 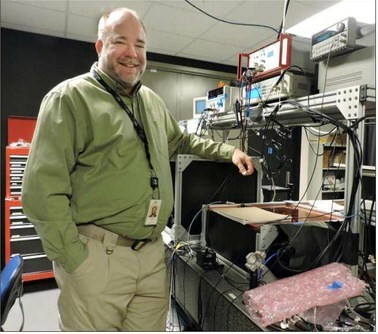 High Technology Foundation program manager Kenneth Witt is working primarily on a project to develop custom lasers that can be used to detect and identify explosives and explosives types. High Technology Foundation program manager Kenneth Witt shows of the second and third versions of an explosive detection device that the Foundation built, called DURRED. The project is called Deep Ultra-Violet Resonance Raman Explosives Detection, or DURRED for short. DURRED is being developed for the Office of Naval Research, he said. Witt serves as an engineer on this project. He is doing all the software development for the machine controls for the user interface and system maintenance and monitoring. Dr. Balakishore Yellampalle is the principal scientist on this project. He designed the lasers and is fluent in the principals of Raman, Witt said. Senior research staff member Robert Martin is doing the chemical and electrical design for the project and works with the physics of the lasers, Witt said. “Raman is a technology where you excite a molecule with a certain frequency of light, or energy, and the molecule will then absorb and re-reflect that light back, and that’s the Raman,” Witt said. Once the light is reflected back, it is examined and the researchers can know what the molecule is based on the reflections. The way the light reflects back generates a signature. The signature lets the researchers know what the components of the molecule are, Witt said. The first phase of the project was proving the concept. Researchers built a generation one and a generation two system for DURRED. These were built in the last three years. The generation two system was wrapped up and reviewed in the summer of 2016. “Our current funding is to take and reduce the size, weight and power to make it more portable and more environmentally friendly,” Witt said. The Navy wants DURRED to be able to be taken outside and in the field. Right now it sits on a bench and weighs 35 to 50 pounds. The goal is to get it under 25 pounds and able to be carried by a person. DURRED needs to be self-contained and run on batteries. The goal is for the battery to have a decent run time, he said. Senior research staff member Robert Martin has been working on an explosive detection and identification device called DURRED. The researchers would like for whoever is using DURRED to be able to detect what material is in front of them and then be able to decide what to do, whether that is sending a person out to dismantle the explosive or deploying a charge or something else, Martin said. The researchers’ goal is for a DURRED user to be able to be 50 feet away from the explosive material he or she is trying todetect. The goal is also to allow the user to identify the explosive quickly. Right now it takes anywhere from 20 to 30 seconds to 2 to 5 minutes for DURRED to determine what type of explosive a material is, Witt said. Another major project the High Technology Foundation is working on is the Tactical Imager for Night/Day Extended Range Surveillance, or TINDERSfor short. “It’s an infrared long range observation detection system,” Witt said. A live prototype for TINDERS has been developed by the WVHTF and has been deployed at the United States Army Night Vision Lab at Fort Belvoir, Virginia, he said. TINDERS observes and detects people from one to two kilometers away. It can detect and recognize a face from up to about 700 meters away. It uses an infrared laser that can be used day or night. It uses a video capture system that takes different profile views of a face and combines them to identify a person, Witt said. The government provided the recognition technology and the database of faces, while the WVHTF focuses on creating the detection part of the project, he said. The main focus of the project is for base security, especially for forward operating bases, which are ones that are on the front line or in hostile areas, he said. Determining who is coming at a base and which direction they’re coming from and if they have funny packages, the sooner you can detect them the better chance you have of making an assessment of what to do, Whitt said. The Army Night Vision Lab is looking right now to add the TINDERS sensor to a group of sensors there. The Foundation is going to the lab soon to integrate its video stream to the lab’s control suite, he said. Dr. Thomas Owens, another researcher at the Foundation, is working on a high power electronics project, Witt said. It is a wireless charging system for vehicles. The Foundation is partnering with a company that makes electric vehicles and company that makes batteries. They are all working together to be able to rapidly charge the vehicles, Witt said. The application of this product is that vehicles in the future could be recharged in 15 minutes and have multiple hours of use, he said. Witt said right now Owens is working on the simulations and proof of concept for this project. Owens is also working on another project to develop an underwater acoustic deterrent system, Witt said. A prototype has already been developed for this project and its purpose is to deter underwater threats from Navy vessels. The prototype creates a fairly focused underwater acoustic beam that makes it very uncomfortable for anyone in its presence, Witt said. The acoustic beam could interfere with a torpedo’s tracking, but it was really designed for keeping people from planting mines on ships’ hulls, Witt said. Right now Owens is working on development and deployment of the prototype, he said. The WVHTC also is currently working on several classified proposals right now, according to Witt.